On this day, 75 years ago Barbara Jordan was born. 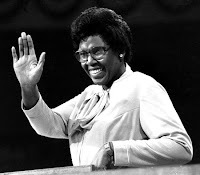 Barbara Jordan was the first Black to give the keynote address at a national political convention. She was an educator, a lawyer and a Congresswoman. In 1972 she became the first African American woman elected to Congress from Texas, and first African American woman elected to U. S. House of Representatives from the South. Just 4 years later she was the keynotes speaker at the Democratic National Convention, where she nominated President Jimmy Carter. In 1992 she was the keynote speaker again and she nominated President Bill Clinton. She received the Presidential Medal of Freedom in 1994. Barbara died on January 17, 1996. Today we salute Barbara Jordan for paving the way for strong powerful Black women of today. Let her serve as a role model for the greatness that we can achieve.